OH YOU GUYS!!!! I can't tell you how frustrated I am. I had written this long post full of pictures from Chicago and stupid blogger would not save it and it is ALL erased!!! I am so mad about this. I will have to do it another day b/c it has already taken up way too much time. I will tell you Chicago was amazing. Thank you so much Newell for such a wonderful time and such good hospitality. Just what this momma needed, some good R&R and maybe just a little ANTM marathon. I promise to post pictures from the trip on my next posting. What would a post be without a semi picture of my sweet BallaRose. Annie and I took our usual trip to Target which is NEVER dull for us and on our way home I turn around and see this! How cute is that!!?? They are holding hands. Will was ready to have his hand back, but BellaRose held on tight. That's my girl. I would also like to "blog introduce" two of my friends. JT meet Katie, Katie meet JT. There is no way you could not be friends. You sew, your creative, you talk about cakes and cookies made at fairs! I mean seriously you two it is just amazing. Well I will be back with more pictures, gotta run as the baby is crying! Apparently my posts are "likeable" as are most of your's according to some brazilian person. I guess that is good, sort of, if they weren't trying to sell something off of my blog. I guess we will get to that later. Well yesterday we reached our 11 month birthday. No huge events happend this month unlike other months, where she sat up, got teeth, or learned to crawl. She did however learn to get out of her bumbo that is in the wagon. I guess that is a big event. We also went to Hendersonville to meet OG (my mom) for lunch and for her to buy BellaRose some birthday gifts. Thank you so much Mom, we love them all. I have also weaned Sweet Girl. I was only on one feeding in the morning, and today we cut that out and gave her cows milk. I am sure this might be controversial to some people. This whole weaning thing can be complicated, but I went with my pediatrician, and she loves the milk so I guess we are all good. We will see if I am "all good" in a couple of days. I will be leaving my sweet little baby on Friday for a long weekend to Chicago. I am so thrilled to go to Chicago and hang with one of my good friends Newell, but I am also very nervous to leave BellaRose. I have only left her once before for a real quick trip to Atl. I know she will be in good hands with Worth, T-love, and Big Poppa, but oh how this Mother's heart might ache! Speaking of a Mother's heart I went back and read some of my hormone fueled old posts of when we first brought BellaRose home and I was so concerned about time passing and me not embracing every moment. I have learned that I do cherish every moment and each day has gotten better and better. As BellaRose interacts with me more and her personality keeps coming out, it Just Gets Better! It is so hard for me to believe that a year as almost past (and you better believe I have already starting thinking about that posting). One year of being a parent to Sweetie Baby. What an honor. This little girl is SO COOL! Just to show you how cool she is, click on this picture to the right and make it larger. Look at her face. How funny is that?! I believe she is really learning to ham it up for the camera now. Of course a camera has been in her face for the last 11 months. I am pretty sure she thinks it just might be a family member! Well I will be back next week, hopefully with lots of pictures to show you of Chi-town (as some people call it). Would you mind helping me with one question though, is today Wednesday or Thursday? If it is Thursday then boy do I have some laundry to do for my trip! The last time we talked with "Big Daddy" we left him on Wilson Creek boating, so lets get you to present day and find out what Worth has been up to! I was wanting, I mean BellaRose was wanting a sandbox in our backyard, and we begged Worth to build us one. One of the MANY beautiful things about being married to Worth is he is an amazing carpenter. I have an idea of something I want and he just runs with it and makes something so much better and more beautiful then I could have ever imagined. As you all know we have had some really gorgeous days here in the Blue Ridge Mountains which sometimes make it hard for Worth to work and I am not exactly pressing him to work either. It feels like College when I would skip class because the weather was just too pretty (you know Mom and Dad I still graduated, and in 4 years so it is all okay). So what do you do on a gorgeous day in the mountains? You build a sandbox! It took 2 days to build, 700 lbs of sand (that I lifted, thank you very much), and a lot of sunscreen for BellaRose. Where the hinges are is a toy box, the back of the sandbox closest to the ugly fence is a planter! To inaugurate the sandbox we had an impromtu playgroup friday morning and I do believe the sandbox was a hit. Susan brought bubbles and this was the first time that Bellaose has ever seen bubbles. I think she loved them, but had no idea what they were. Worth is at the beach right now (too bad he did not just "steal" the 700 lbs of sand) and is wanting pictures up here on the blog so he can show his buddies and Big Poppa and T-love! I hope you do enjoy and please come play. There is room and enough seats for all. 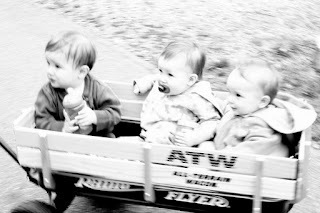 As promised here is a picture of BellaRose, Will, and Rylie in her wagon heading over to Becky's house. I would almost do anything to claim that I took this picture, but I did not, and I probably would not do anything to have taken this, but it is pretty awesome. Melissa took this image, dang it! Come on, how cute are these babies! Speaking of babies, we have recently added to this baby clan (as you may have heard) with Ellen's arrival. I could not be more excited for Becky and Jeremiah. It really takes me back to that time when we first brought BellaRose home and how hard, and wonderful that was all at the same time. It goes so quickly and now here Sweetie Baby is almost a year old! She gets cooler and cooler everyday. I feel so honored to be her mother and to see her grow and change daily. You want to know what else will be growing soon? Our garden! I have a feeling this last cold will be the end, but I am not willing to risk it just yet. Worth heads to the beach this weekend and then I go to Chicago (yeah Newell!!) the next, so after that the garden goes in! We are talking, corn, pumpkins, soy beans, tomatoes, basil, squash, a summer cornicopia of goodness if you will. But first let me tell you about my phlox. I just love this stuff. In the summer it is not as pretty, but come March when you are just so stinking over the cold, her comes these little buds of purple peaking through all the brown and it just makes me want to go put on a sundress! Please go find some phlox and roll around in it because it is just so lucsious. Just look at this! I mean, are you serious? Look how wonderfully cute this outfit is, handmade just for our sweet BellaRose by a dear old friend (my friend not being old, but the length of our friendship), Jennifer Talbert Perry or as we like to call her, JT! She requested that I don't look at the flaws of this outfit to which I reply again, are you serious?! Like I would be able to tell a flaw in this gorgeous master piece. We got so many compliments on this outfit. I am always amazed at the talents of my friends from their sewing, painting, clay making, cooking, photography to just all out creativity. You really are some very talented people! Thank you! Another wonderful part of this outfit is that we got to do yet another photo shoot with Little Bean. Any opportunity I can have to take pictures of BellaRose I jump on. Thanks again dear friend! We also welcomed Joyfully into this world Ellen Mekay Swann to the parents of Becky and Jeremiah Swann. She is just as sweet and as cute as ever and soon to be one of BellaRose's best friend just as Becky is to me. Welcome sweet little baby girl! I woke up to birds singing this morning, even before BellaRose woke up. The Sun is out FINALLY. I bought a blueberry bush from Ingles last night because I just HAVE to plant right now. My phlox is blooming like crazy. My peonies are coming up with a vengence. I see signs of hosta. I got to hang with Jessica, Lisser, Annie, Becky, Rylie, and Will yesterday and go on a wagon ride (pictures to come, right Lisser?) My Grandma is out of the hospital and feeling pretty good. I smell like mild-dew from my bath towel even though it is freshly washed. Things are looking good! LA VITA E BELLA! I would like to thank each and everyone of you for your beautiful prayers for my Grandma. They were answered. Please continue to lift her up as I hear growing old is not for the weak hearted. Love to you on this beautiful spring day. B-Rose and I are off to dig in the dirt and hopefully figure out a way not to smell like mild-dew! BellaRose and I got to spend the day with Worth at the river (WilsonCreek) on Sunday. This river is cool because the road is right above it so we got to follow Worth all the way down and take some pictures of him a long the way. I am sure he would have much preferred to have someone actually on the river with him, but we all seemed to manage. BellaRose got to see her daddy in action doing one of the things he does the best. Like I told you before I can't wait until Worth can take her on the river. Of course she will not start off on these rapids! On Friday we went to Little Gym with Annie, Will, Jennifer, and Davis. 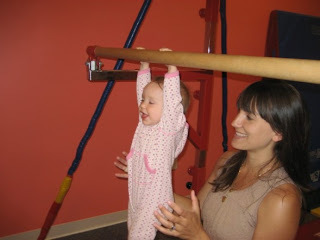 I think that BellaRose is an aspiring gymnast. She hung on the uneven bars BY HERSELF! Look I am not holding her. It was so much fun to see her hanging there. You can see the joy on her face. Little babies are just amazing on what they can do. She is so funny when you put sunglasses on her. She makes that same face everytime! I would like to give a big shout out to Niki and Jeremiah Swann (they aren't married, just in-laws). They both turn the dirty thirty today!! Haha! I still have 6 more months of being in my 20's and you better believe I am going to live it up. Calling all Prayer Warriors out there, I would like to ask you to lift my Grandma up as she has been in the hospital since Thursday. I ask this with a very heavy heart. I was wondering if I should even write to you about this, but feel as if I should. I ask that you pray that she gets her strength back and that the doctors figure out the best way to help her and make her comfortable. They aren't really sure what happened to her which is probably the most frustrating part. Some say a mild stroke, her doctor says oxygen did not get to the brain for a second (not sure if that is a stroke or not). Anyway, I have talked to her and she is joking around and beating my dad at cards so that is all positive. They hope she will go home today. She is not getting much sleep in the hospital which is hard for her. I thank you all from the bottom of my heart. I know you have come to love Grandma too! First let me apologize for the amount of pictures I post here. I take at least 100 pictures at any one time, so trying to figure out which pictures to post is a very difficult task. That being said, we had the wonderful joy of having Will over for the afternoon yesterday. It was a beautiful day and BellaRose probably needed a visit from her good friend. Will was so much fun. He helped me dig in the dirt and joyfully threw the ball for Rainy (who was thrilled to have someone finally do that for her). Will loves any type of round object and Rainy's favorite thing in the world just happens to be a green round object so they were two peas in a pod for sure! Please come over again soon Will! Sweety Baby has been wanting to get the dog's water bowl ever since she could crawl. We were hanging outside on a wonderfully warm day and I let her have it, and boy did she ever! She was a complete mess but had so much fun. Poor thing is working on her 5th tooth (as well as a very runny nose) and is a little uncomfortable so any pleasure I can bring her I do willingly! All CLEAN and all cute!